This article is about the guest star. For the character, see Steve Buscemi (character). 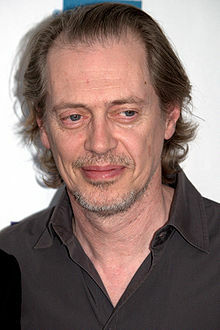 Steven Vincent "Steve" Buscemi (born December 13, 1957) is an American actor, director, and writer. He voiced himself in the season 14 episode "Brake My Wife, Please" and as Dwight Diddlehopper in the season 19 episode "I Don't Wanna Know Why the Caged Bird Sings". One of his most notable credits, as mentioned by Homer Simpson in the past, is the film Fargo where his character gets fed into a wood chipper.